In this game, you play as Kelby, a Maraquan Shoyru. You have to cushion the Jubjubs' fall by blowing out bubbles to help them fall safely. As time passes by, the Jubjubs fall faster. Lose three Jubjubs and the game is over! Use your mouse to move Kelby. To catch a Jubjub in a bubble, position yourself beneath it, then click and hold the left mouse button to adjust the distance that the bubble will travel. A line of smaller bubbles will appear to mark the trail your bubble will travel. To release the bubble, let go of the mouse button. 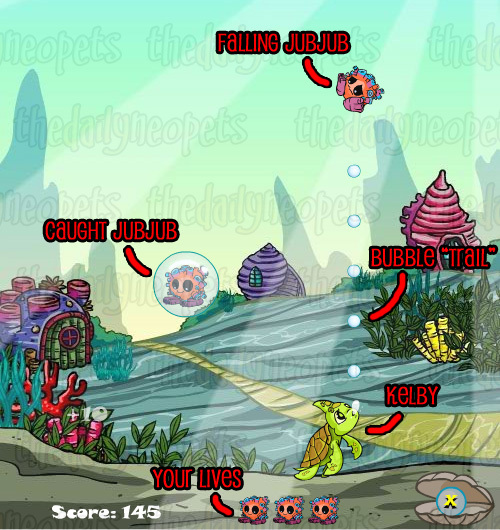 There are three items you can pick up in the game: Jubjubs (10 pts), shells (5 pts) and Dubloons (25 pts). You will only lose a life if you miss a Jubjub. Position your mouse directly over the item. I found it easy to play like this. Blow your bubble when the meter range is just below the item. Remember that the game has gravity, so the item falls while your bubble goes up. They should meet exactly on the chosen range you blew your bubble at. Always remember the score each item gives. Dubloons are worth 25 points, and shells are only worth 5 points. In the event you see both of them falling at the same time, blow the bubble cushion onto the dubloon first, then onto the shell. In earlier rounds where Jubjubs fall slowly, try getting the dubloons first before the Jubjubs. But in later rounds, your priority is the Jubjubs. You won't lose a life if you don't get the dubloon anyway. You only have three lives, so be careful. If you think you can no longer catch a shell inside a bubble, just stay away from it. You'll be temporarily stunned when hit by a shell. In conclusion, we've learned all the basics of Jubble Bubble, how much each item is worth, and learned some tips for easier gameplay. As I always say, practice makes perfect. Try and try until you master this game. The Snowager is awake. He'll be sleeping in 17 minutes, 23 seconds.